Laurie Here - Contemporary Fiction and MORE - Book Reviews: #REVIEW #NEW RELEASE #Blog Tour - Today, Oct 6th! 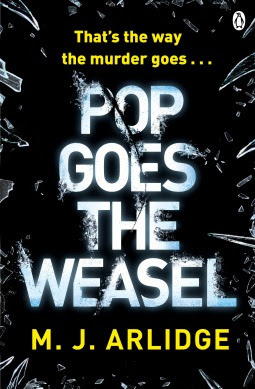 "Pop Goes the Weasel" by M J Arlidge! 5 Amazing Stars! #REVIEW #NEW RELEASE #Blog Tour - Today, Oct 6th! "Pop Goes the Weasel" by M J Arlidge! 5 Amazing Stars! This book is the second book in the Helen Grace series by M J Arlidge, (her first was Eeny Meeny.) These books are in no particular order, so you can pick either of them up to enjoy reading without having to have read the previous book. This book is about a new and different serial killer now on the loose in the darkness of the city streets of London. In this book, we now have a new serial killer who seems to be only after men, or at least so far it is only men who have been killed, and the way they die, or were ‘killed’, just doesn’t quite seem a strong enough enough words to describe what happened. After these men are killed, their hearts are literally ripped out of their chests, and most are even delivered to certain people, in particular, their families, or sometimes the heart is only halfway torn out, as if the serial killer got interrupted in the kill. Either way, this serial killer is cold, calculating, and absolutely sickening in what it does, and it is incomprehensible in what is done. Now, to catch ‘em! This is where DI Helen Grace comes in! If anyone can solve something like this, it is her. The thing that blew my mind was they wanted her OFF the case at one point! Does this stop her? NO WAY! This is about all I can tell you about from this book so I don’t give ANY spoilers away! I will say this again, though, if you love thrillers, this series is one you will become addicted to on the very first page! I say this 'series' because at the end of this book, SURPRISE! A THIRD book is coming out!!! It states, 'the next chilling case', "The Doll's House", available from the New American Library, is available in February 2nd, 2016!' I can't WAIT!!! Yes! It IS available for Pre-Order NOW!!! This author, M J Arlidge, does not disappoint the reader at ALL! She is one unique and remarkable writer about serial killers and the stories she writes to put her heroine, DI Helen Grace into. She is one very talented writer! I have to admit, in my opinion, that this author is one of the BEST out there writing serial killer novels! Her plots and the way they play out are so amazing! The only complaint I have is they are SO EXCELLENT that I cannot stop reading these so quickly! These stories have you glued to reading about everything that is happening sentence after sentence that you are not going to put this book down! I really mean it when I say you end up ‘reading ferociously through these’! I read the ebook galley, and I just kept my thumb/fingers constantly ready to flip the page! I want to thank the Publisher, Penguin Group/Berkley/New American Library and NetGalley, along with the Publicist who coordinates all reviews, Blog Tours and more for inviting me to be a part of this book in exchange to write a review of my own opinion. Thank you!